Taking to the stage with an out-of-tune bass guitar can be unprofessional and embarrassing. Even when practicing alone, you can only learn to play the music you love if your guitar is in tune. Whether you are an international bass guitar star or just practicing in the privacy of your own bedroom, you must tune your bass right for it to sound right—the four-string bass guitar is no exception. 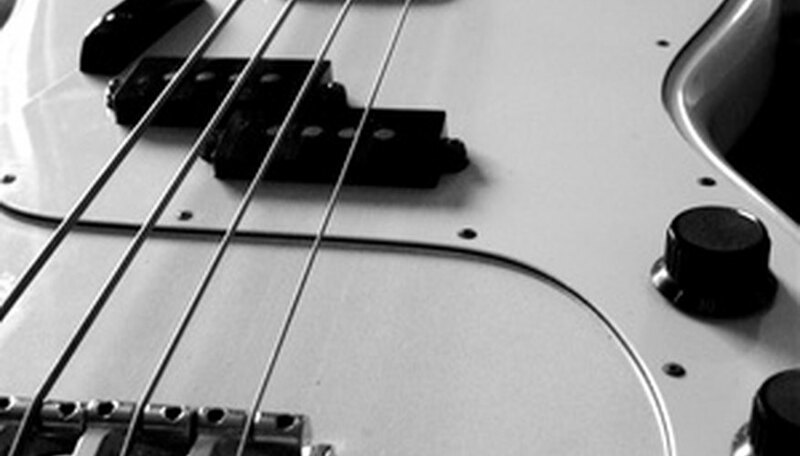 Familiarize yourself with the four-string bass tunings and the way in which they are written. Tunings on four string bass guitars are written in order from the thickest, lowest-sounding string to the thinnest, highest-sounding; standard tuning is therefore written E,A,D,G where E is the lowest note. Examples of other four string bass tunings are drop D tuning (D,A,D,G), drop C tuning (C,A,D,G) and ½ step tuning (Eb,Ab,Db,Gb). Look for tuning indication on your sheet music, or ask your band mates what tuning they are using. If you are playing a song from sheet music or through bass guitar tabs, then the tuning should be indicated at the beginning of the song. If you are playing with a band or improvising, using the same tuning as the guitarists, keyboard players or vocalists will mean the instruments blend together. Find tone-perfect examples of the notes corresponding to your bass strings and play them back to yourself. The most effective way to find tone-perfect notes is to use an Internet bass tuner; these web applications play any note, of any four-string bass tuning, with clarity and precision. Tuning the bass guitar to "standard," for example, would require you to find the bass notes E,A,D and G. Websites such as tunemybass.com and get-tuned.com provide custom tuners capable of playing any bass note for any guitar string. Manually tune your strings to the notes given by the Internet tuner. Beginning with the thickest, lowest-sounding string, playback the note from the Internet tuner and twist the corresponding string's tuning pegs (the twist-ble screw at the head of the bass guitar) until the notes sound exactly the same. 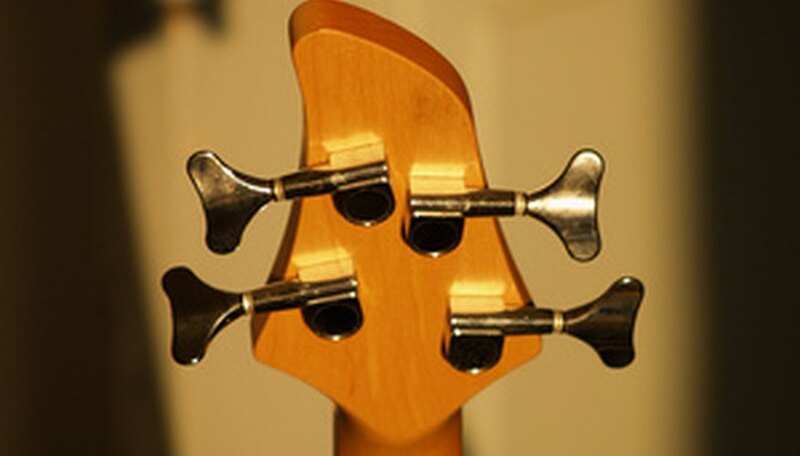 Four-string bass guitars are strung so that turning the peg clockwise will give the string a lower tone while twisting the peg counter-clockwise will raise the string's tone. Tune the other three strings to the notes provided by the Internet tuner using the strings' equivalent tuning pegs. Playback all four-string notes on the Internet tuner and on the guitar to confirm the bass tuning; if any notes sound slightly out of tune, re-tune the string until it sounds exactly the same as the Internet tuner's note—even one note slightly out of tune on a bass guitar can make a song sound awkward and disjointed. Double-check your tuning; sometimes the tensions exerted on the neck of the guitar when twisting the pegs can alter the strings you have already tuned. Invest in an electronic tuning pedal; these tuners connect to your bass guitar port with a jack-to-jack cable and visually show you the precise note as you play a string. Instead of an Internet tuner, use a keyboard, piano or guitar to playback the notes you need. Tuning four-string bass guitars to much higher tones can tighten the strings to such an extent that they may snap; this can potentially cause serious damage to the face, eyes and hands if not protected.